NEW: American Record Guide's James Harrington gives glowing review of Robert Schrade’s CD in the May/June 2010 issue! It was a little over a year ago that I had the pleasure of reviewing the first release on the Impromptu label, Homage to Chopin (60801, Jan/Feb 2009). Among the works on that disc were a very fine set of Chopin’s Preludes. The pianist was also named Schrade –- Rorianne, to be precise, daughter of Robert. Daughter is the driving force behind getting her father’s performances back before the public; and, as this release makes abundantly clear, she is the apple that didn’t fall far from the tree. Her mother, Rolande Young Schrade, is also a pianist (and composer) and the three have often performed together. The only other example I can recall where father, mother and child were all world-class pianists that performed together is the Casadesus family (Robert, Gaby, Jean). This recital was given on March 13, 1960, so it is released 50 years after it was performed. Robert Schrade, from all reviews nd other quoted material in the booklet (excellent notes by Rorianne), as well as the performances given here, was an outstanding, world-class pianist, and is still an active, respected teacher in New York. I can only surmise that in 1960, America and most of the rest of the world were infatuated with Van Cliburn. Robert Schrade was most likely in a small group of great pianists that were simply overshadowed by Cliburn’s larger than life effect. This is taken from reel-to-reel recordings, and there is no editing other than some noise reduction and cutting down on the applause between numbers. I might prefer to have five seconds of silence between the shortened applause and the beginning of the next work, which seems to start rather abruptly – a very minor concern. The piano sound is very respectable for its age. The performances are outstanding. The Beethoven Variations bring to mind the legendary Rachmaninoff recording – clean, precise and clear, but with the full measure of sturm und drang that was so dominant in Beethoven’s middle period. Schumann’s Faschingsschwank is not played as often as a number of his other large scale works, and this recording makes you wonder why. At under 20 minutes, it is not as long as Sonatas 1 and 3, Carnaval, Humoreske, Kreisleriana, Fantasy, etc. Its ebullient character is brought out perfectly by Schrade. The last big work, Chopin’s Sonata 3, is given a truly heroic performance, very much befitting its stature as one of the greatest works for piano. Tempos are fairly quick, and even the pathos of the Largo movement keeps moving along. But it is the finale that puts even the greatest pianists to the test. I have heard more than one concert performance marred by the pianist running out of gas. Some miss a note or two at the very end. Not so here – not even an inkling of slowing down on the third statement of the main theme, where the left hand has twice as many notes as the right. A brilliant driving coda brings the house down. As a sure indication of the amount of adrenaline Schrade must have had flowing, his first encore is the fastest performance of Debussy’s Doctor Gradus ad Parnassum I have ever encountered. Chopin Etudes in E and A-flat, more Schumann (from Kinderszenen) and a short piece by Mrs. Schrade conclude a most memorable recording. We are informed in the booklet that Volume 2 is planned, with works by Albeniz, Balakirev, Brahms, Barber, and Mozart. I can’t wait! Robert Schrade has been hailed across the globe as one of the important pianists of our time. Since his Town Hall debut in 1949, he has received unequivocal praise from such critics as Paul Hume, Virgil Thomson, Harriet Johnson, and Harold Schonberg, who wrote that, “Robert Schrade is entitled to a vote of thanks for his enterprise in casting off the shackles of the conventional repertoire.” Indeed, Schrade has pioneered themed programs, in New York recitals and numerous tours of Europe, Canada, and the U.S., that have brought to audiences a vast repertoire, including rarely heard masterpieces of known and lesser-known composers. Notably, Schrade’s brilliant interpretations of the works of Ernest Bloch inspired the composer’s request for him to play his Concerto Symphonique for piano and orchestra, a performance which took place in Carnegie Hall (1965) to ecstatic critical acclaim. Along with Schrade’s performing (from which several finger surgeries necessitated an eleven-year absence), Schrade maintained a distinguished teaching career at the Manhattan School of Music (where he had been a pupil of Harold Bauer), and also at the Chapin School and privately. His dual reputation led Bill Zakariasen of New York’s Daily News to write, “Great pianists seldom make great teachers, and great teachers are seldom great soloists, but once in a while we find an exception like Robert Schrade” (from a review headlined “Schrade: Back and Beautiful”). With his pianist/composer wife, Rolande Young Schrade, he is founder and director of Sevenars Music Festival (Worthington, Massachusetts), approaching its 43rd season. Originating with concerts that included his musical family (referred to as “the Schrade dynasty” of pianists by the N.Y. Times and WOR-TV), Sevenars has grown to be nationally known, chosen “one of the six best small music festivals in the U.S.A.” by Time Magazine. Robert Schrade continues to attract his devoted following there, while his family, which joined him on the Steinway global roster (the first family to be so honored) has also joined him there, as well as at Lincoln Center and other prominent venues. 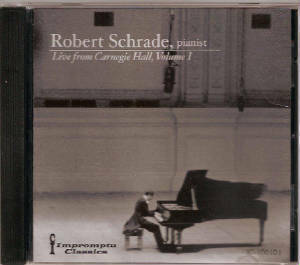 Impromptu Classics is honored to share the genius of Robert Schrade with a new generation of listeners. Available now at your favorite Internet retail stores! Please check back for further updates!